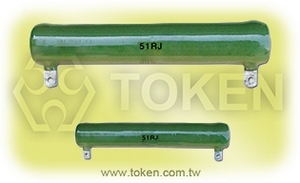 Token (DRB20) Vitreous Enameled Resistors - strong moisture-proof characteristics, high energy power. Power Wirewound Enameled Resistor (DRB20) Is a cylindrical ceramic tube at both ends clips to fixed terminals. Ceramic tube winding copper nickel or nickel-chromium alloy resistance wire. Surface coated with moisture-resistant, heat-resistant, non-corrosive, non-flammable coatings (such as silicone, epoxy, cement, glazed porcelain, etc.). After high temperature treatment, the resistor dried and insulation fixed, then fitted with fixed foot frame. Due to good flexibility, (DRB20) can be made of multi-terminal, low inductive resistance, semi-adjustable type of various types of resistors. Resistance range from 1.7Ω to 75KΩ, with power ranges from 8W to 500W, and optional tolerance accuracy of ±1%、±5%、±10%. Size of cylindrical ceramic tube matches with industry standards . Tubular series power-glaze wire wound resistor (DRB20) widely used as brake resistors, bleeder resistors, aging resistors, brake resistors. According to different occasions, but also can be called brake resistors, discharge resistors, load resistors, current limiting resistors, charging resistors or discharge resistors. Non-inductance series adopts Ayrton Perry winding method to eliminate inductance parasitic effect, so as to minimize inductance, suitable for high energy consumption, high-temperature environment. Be glazed coating protection, not afraid of external mechanical strength and dust environment. Not only large power and strong, shock-resistant, but also features good heat dissipation. This (DRB20) is easy to install and use. This is suitable for a variety of applications. More than 1.2 times the same specifications or requirements of peer production, more power, can be long time loading and impact. Applications include industrial machinery, load testing, power distribution, instrumentation and automation control devices. Token Electronics (DRB20) vitreous enameled power wirewound resistors meet RoHS compliant, lead-free standard and short production cycle. Those Products widely used in power tools, switch applications, power supplies, welding machines, high voltage applications, consumer product applications, home entertainment, home appliances products. For the customized special applications, please contact our sales to discuss the details. Glaze coating, simple structure, easy to install. Fixed resistance and adjustable resistance optional. Electric tools, Consumer product applications. Power supply, high voltage applications. at one of DRB20-T, FVR, DQS, DSRA, DSRB, BSR, BSQ, VR (Variable Resistor) type. Product type means one of FVR, DQS, DSRA, DSRB, BSR, BSQ, DRB20-T.